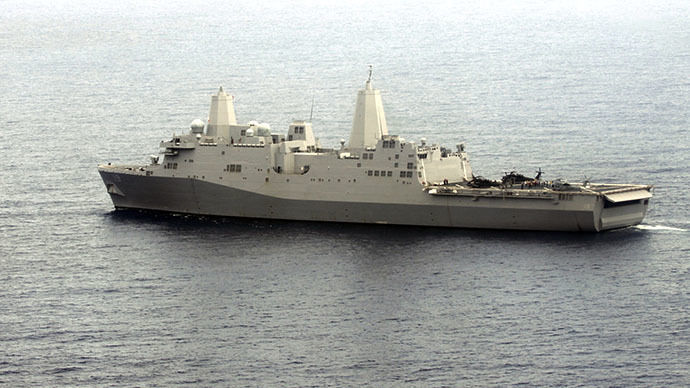 The USS Mesa Verde with 550 Marines onboard has entered the Persian Gulf on Monday for a possible operation in Iraq. It comes after President Obama ruled out sending ground troops to the militant-assaulted country. The USS Mesa Verde is a San Antonio-class amphibious transport dock, a ship designed to carry an expeditionary force across the sea and deploy landing craft and helicopters. The ship’s presence in the region “provides the commander-in-chief additional options to protect American citizens and interests in Iraq, should he choose to use them.” Pentagon Press Secretary Rear Adm. John Kirby said in a statement. “USS Mesa Verde is capable of conducting a variety of quick reaction and crisis response operations. The ship carries a complement of MV-22 Osprey tilt-rotor aircraft.” He said. Washington already dispatched the aircraft carrier USS George H.W. Bush to the Gulf on Saturday. President Barack Obama said he considered military action to help the Iraqi government deal with the threat of militant offensive which has already claimed large parts of the country in a surprise lightning operation. But the president said he didn’t intend to send ground troops to Iraq again, two years after pulling out American troops from the country.